Were there eyewitnesses who testified that the Nazis used gas vans to murder Jews at Chelmno and along the Eastern Front? Were these testimonies reliable? The eyewitness testimony about the use of gas vans, whether at Chelmno or by Einsatzgruppen units, is nothing but a “wild conglomeration of conflicting claims” and is of “no evidentiary value.” Therefore, the gas vans never existed. There were many eyewitnesses to the design, construction, and use of the gas vans. These eyewitnesses included the drivers of the gas vans, the heads of the Einsatzgruppen units that employed the gas vans, and, finally, bystanders and survivors in the East and at the Chelmno death camp. While there are slight variations in their testimony, which is often the case with eyewitnesses, each of the testimonies agrees on major points. Further, primary documents corroborate the testimonies. Who described the gas vans and their use? Eyewitnesses include gas van drivers, the heads of the Einsatzgruppen units, survivors, and bystanders. Eyewitnesses agree in their overall descriptions of a gas van. From the outside, a gas van looked like a normal dark gray or green-gray delivery van. The doors into the cargo area at the back of the van were hermetically sealed with a rubber lining around the edges. The interior of the cargo area was lined with galvanized iron and the floor was covered by a wooden grid or grate that could be lifted for cleaning. Underneath the wooden grid or grate was an opening that connected to the engine and fed the exhaust gases into the compartment. The smaller vans held 30 to 50 people and the larger vans between 50 and 70 people. When and where did we first learn about the gas vans? Evidence about the use of gas vans first surfaced in 1942. 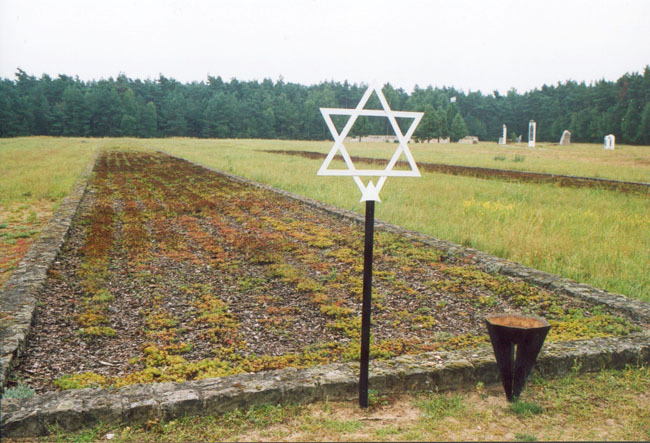 Shlomo Winer (also known as Jacob Grojanowski) was a member of the Sonderkommando at the Chelmno death camp. He escaped in early 1942 and made his way to the Warsaw ghetto, where he gave Hersh Wasser of Oneg Shabbat a detailed account of what he had seen. In his report, Grojanowski said, “We didn’t have to wait long before the next lorry arrived with fresh victims. It was specially constructed. It looked like a normal large lorry, in grey paint, with two hermetically closed rear doors. The inner walls were of steel metal. There weren’t any seats. The floor was covered by a wooden grating, as in public baths, with straw mats on top. Between the driver’s cab and the rear part were two peepholes. With a torch one could observe through these peepholes if the victims were already dead. Under the wooden grating were two tubes about 15 cms [centimeters, or about 6 inches] thick which came out of the cab. The tubes had small openings from which gas poured out . . . There were two such vans.” Grojanowski fled the Warsaw Ghetto for the Zamosc ghetto. He was apparently deported a second time from Zamosc to Belzec, where he was murdered. Throughout the 1950’s and 1960’s, postwar trials discussed the use of gas vans at the death camp of Chelmno and along the Eastern Front. The postwar trials took place in numerous German cities, including Düsseldorf, Hamburg, Darmstadt, Hanover, Munich, Koblenz, Essen, Karlsrühe, Wuppertal, Cologne, Giessen, and other cities in West Germany. From these numerous trials, evidence for the existence of gas vans is overwhelming. Thus, perpetrators, survivors, and bystanders in Kharkov (Soviet Union), Kiev (Crimea), Stalino (Ukraine), Chelmno (Poland), Poltava (southern Ukraine), Baranovichi (Belarus), Minsk (Belarus), the Caucasus (Soviet Union), Belgrade (Yugoslavia), and Riga (Latvia) described similar vehicles, varying only in minor details. Perpetrator, survivor, and bystander eyewitness testimonies corroborate each other on all major points. The gas vans existed; the Nazis and their collaborators used these vans to murder Jews and others in the death camp at Chelmno and in the East. Ingrid Weckert, “The Gas Vans: A Critical Assessment of the Evidence” (“4.1. Russian ‘Murder vans’”) and (“4.2.2. Description of the ‘Gas vans’”) at http://www.vho.org/GB/Books/dth/fndwagon.html. Oneg Shabbat (Hebrew) or Oyneg Shabbes (Yiddish) was the code name of a group led by Jewish historian Dr. Emanuel Ringelblum in the Warsaw ghetto. The group included historians, writers, rabbis and social workers. It was dedicated to chronicling life in the ghetto. They collected documents and testimonies, essays, diaries, drawings, posters and other materials describing life in the ghetto. The collection was started in September 1939 and ended in January 1943. Before the ghetto was liquidated the material was buried in three milk cans and ten metal boxes in three separate locations in the ghetto. Two of the milk cans were found in 1946 and the ten boxes in 1950. The third cache has yet to be uncovered. As of the two discoveries, the collection contains about 6,000 documents and is archived at the Jewish Historical Institute in Warsaw. Martin Gilbert, The Holocaust: A History of the Jews of Europe during the Second World War (Holt, Rinehart and Winston, 1985), p. 255. You can read the entire report at pages 252-279. Eugen Kogon, Hermann Langbein, and Adalbert Rückerl, editors, Nazi Mass Murder: A Documentary History of the Use of Poison Gas (Yale University Press, 1993), p. 57. Eugen Kogon, Hermann Langbein, and Adalbert Rückerl, editors, Nazi Mass Murder: A Documentary History of the Use of Poison Gas, p. 67. Eugen Kogon, Hermann Langbein, and Adalbert Rückerl, editors, Nazi Mass Murder: A Documentary History of the Use of Poison Gas, pp. 61-62. Eugen Kogon, Hermann Langbein, and Adalbert Rückerl, editors, Nazi Mass Murder: A Documentary History of the Use of Poison Gas, p. 62. Eugen Kogon, Hermann Langbein, and Adalbert Rückerl, editors, Nazi Mass Murder: A Documentary History of the Use of Poison Gas, p. 63. Eugen Kogon, Hermann Langbein, and Adalbert Rückerl, editors, Nazi Mass Murder: A Documentary History of the Use of Poison Gas, pp. 59-60. Also, see: p. 77. Eugen Kogon, Hermann Langbein, and Adalbert Rückerl, editors, Nazi Mass Murder: A Documentary History of the Use of Poison Gas, p. 71. Also see: pp. 61-62.